Back Design Line design in shades of brown with a pink centre. 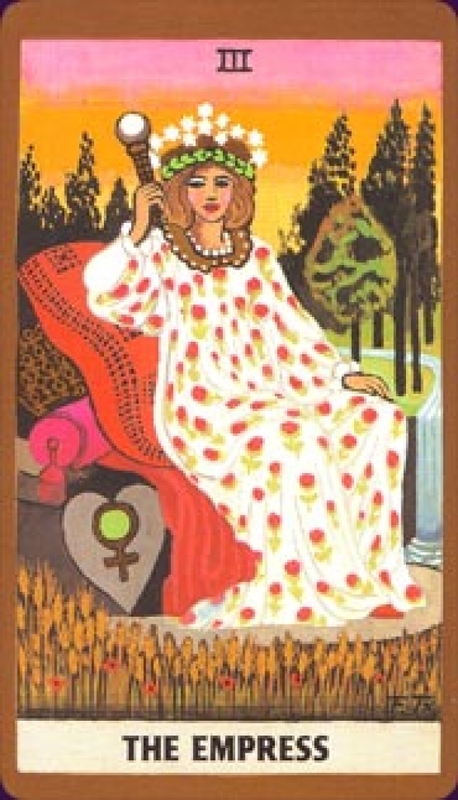 Rider-Waite-Smith deck, I finally found a deck that really speaks to me. I think the colours of the standard deck are hideous, the "original" Rider-Waite is too "washed out" and the Universal Waite, with colouring by Mary Hanson-Roberts is to watery for my taste. So I started to buy, use and love so-called Rider-Waite clones. The Golden Tarot by Kat Black was my favorite one but I also liked The Morgan-Greer, Tarot Illuminati, Aquarian, Hanson-Roberts and many other decks that stayed close to the RWS deck. Why I did so? I wanted to learn the Tarot studying the loads of literature that use the RWS to explain the symbolism of the tarot. I knew about the existence of the "Golden Rider" deck by Francois Tapernoux and I liked the pictures I had seen on line but I thought I had enough RWS-decks I did not use and I had read a blog where the reviewer was disappointed about the artwork. because the pictures are made using oil paint, the subtle fine lines were lost, according to the reviewer. Is there a downside to this deck? I can think of only one minor thing. If a tarot book mentions the symbolism of the colours in the tarot, you may find that the colours in this deck are so different it does not match with the meanings in that part of the book. I don't mind that at al but it may be inconvenient when you take this deck to a tarot course. For everyone who has the same awkward relation with the RWS deck as I have, I strongly recommend this deck.